My name is Mónica López. I have a son with15 and I'm a wife and housewife, too. I'm a computer expert but when my son was born, I decided to look after him at full time. In 2010 I discovered the scrapbooking in a Facebook group. 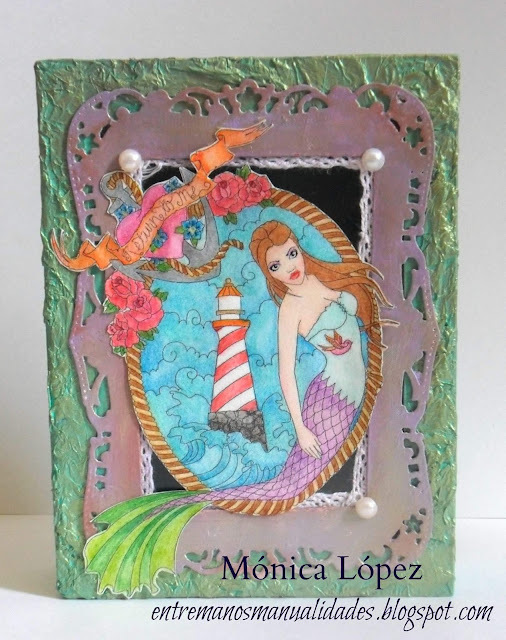 Then I experimented the cardmaking and I loved it. Making cards a hobby and a job for me. This kind of art has been very successful for me and I'm excited when I listen to my client and friends: " do you make that? What a nice project! Congratulations"
My stile is Clean & Simple, my main tool is the crop a dile, I love using pearls, glasses and my favourite technic is piecing paper. Hi, my name is Elisa. I am from Costa Rica, but I live in California, USA. I am the grandmother of 4 fabulous kids and the fifth one is on his way I love crafts, my own grandmother (abuelita) taught me how to crochet when I was 4 and that was the beginning I love to paint, sew, crochet, etc. A good friend introduced me to the scrapping world and it was love at first sight. I love paper, its texture and flexibility. I am very happy to be here in this new adventure, I hope you like my creations Thank you for this opportunity and we'll be in touch! Our challenge runs all month, so you have another little time to play along and link your project up to receive a wonderful comment from our Design Team members. Plus you'll be eligible for the March prize draw. Remind!!! This month, our prizes are amazing!!!! We're looking forward to see your projects!!! !